There are various products on the market which can be used to make a cast of a gun chamber. To be certain that the product we are offering you is the best and most practical, we contacted the basic manufacturer. They recommended Cerrosafe because of its unique features. Unlike Woodsmetal which swells upon cooling and cannot be removed from a gun chamber, Cerrosafe shrinks during the first 30 minutes of cooling and then at the end of an hour, is EXACTLY chamber size. At the end of 200 hours it will have expanded approximately .0025". This factor is well known by all toolmakers and they will take it into consideration when making dies or reamers or gauges from your cast - if you will tell them the cast is of Cerrosafe. 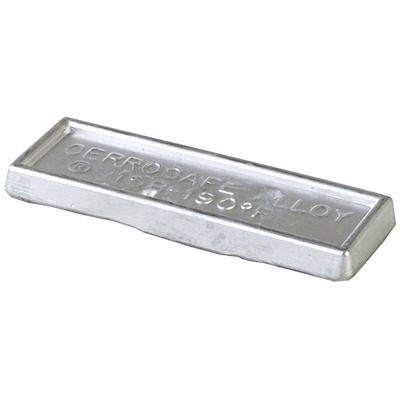 Cerrosafe melts between 158° - 190° F. It should be melted in a clean, iron ladle. Source of heat should be removed as soon as the alloy is completely melted, at which time it is ready to pour. The solidified casting should be removed from the chamber before, or when, it cools to room temperature. If allowed to remain in the mold over an hour, it will grip the chamber walls and be difficult to remove. Clean the chamber of the rifle thoroughly, then plug the bore immediately ahead of the throat with a small rag - but not so tightly it cannot be driven out. If possible, pour the molten Cerrosafe through a small tube into the bottom of the cast, gradually removing the tube as the chamber fills. If the barrel is cold, warm it to room temperature or above before making the cast. When cooled, remove from chamber, using a rod or dowel from the muzzle end of the gun. SPECS: Sold by weight. Alloy. Infinitely reusable.